White flakes, itching and hair loss are the most common problems faced by people due to dandruff. It is caused by a fungus called Malassezia which is normally present on our scalp. But due to various reasons like pollution, improper hygiene and hormonal changes, the fungus produces a bi-product called oleic acid. This acid triggers excess skin cells shedding on which the fungus feeds on to live. The end products released by fungus lead to itching and dryness. Though dandruff is harmless and non-contagious, the white flakes can lead to embarrassment. Actually, dandruff cannot be cured completely, but it can be controlled to maximum extent with natural ingredients like apple cider vinegar, aloe vera and baking soda. In this article, let’s learn about apple cider vinegar for dandruff in detail. Does Apple Cider Vinegar Work In Treating Dandruff? ACV is rich in probiotic content which makes it a powerful antibacterial in nature. It kills the fungus causing dandruff and other scalp infections. Its anti-inflammatory properties soothes the swelling and irritation caused by dandruff. The acidic levels of ACV balances the pH levels of the scalp which help to control the fungus growth, removes accumulated impurities without damaging the natural oil production. The enzymes present in it open the clogged pores to make the scalp healthy and keep the scalp infections like dandruff at bay. It acts as a mild conditioner which helps to reduce itchiness and flaking of the scalp. It also helps to add shine and volume to the hair. The most effective methods of using apple cider vinegar for dandruff involves mixing equal amounts of water with apple cider vinegar to create a miracle spray. Alternatively, you can apply ACV directly to the scalp if you need a stronger solution to your dandruff problem. This process involves direct application of ACV to the scalp. If you have sensitive skin, wounds or open sores on the scalp then avoid trying this process and follow the second method. Using a cotton ball, apply apple cider vinegar directly onto the scalp. Gently massage the application in circular motions for 3 minutes. Wrap your head with warm towel. This allows ACV to penetrate into scalp. Leave it on for one hour, then rinse off with water. Repeat twice weekly for a month. Note: Do not use shampoo to wash off the ACV application. 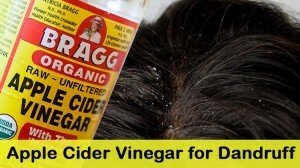 If your scalp cannot withstand the direct application of apple cider vinegar then you can try this process. Spritz it on hair and scalp. While spraying, make sure to avoid eyes and ears. Wrap hair in a towel and leave it on for 30 minutes. Remove towel and rinse with water. Note: If you are trying ACV for the first time, then add 1 teaspoon of apple cider vinegar into 2 cups of water and follow the remaining process. It is better to start with less quantity and gradually increase it. This process can be followed after taking your shower. It helps to give relief from the itchiness caused by dandruff. Add 1/3 cup of raw apple cider vinegar to a liter of water. After taking your regular shower, rinse your hair with the solution. Fenugreek contains antifungal properties which is effective in battling the dandruff caused by fungus growth. Its natural emulsifying properties moisturize and hydrate the scalp. Soak fenugreek seeds in enough amounts of water for 5 – 6 hours. Strain the water and blend fenugreek seeds to make a paste. Add a few drops of apple cider vinegar and mix well. Apply the mixture on scalp and leave it on for an hour. Essential oils are very potent in nature. They contain antimicrobial, anti-inflammatory and soothing properties. Wash your hair with a mild pH balanced shampoo. Mix 2 parts of apple cider vinegar with one part of water. Add a few drops of lavender, lemon grass, or rosemary oil and mix well. Pour the solution into a spray bottle and spritz it on scalp. Massage it gently for 3 minutes. Heat 1-2 cups apple cider vinegar until lukewarm. Standing over a sink, pour the ACV over your hair. Cover your hair with a towel and leave it on for an hour. Repeat the treatment twice in a week for one month. Note: You can also apply the warm ACV directly to your scalp with a cotton ball and leave it on 10-15 minutes before rinsing. The nutrients present in grape seed oil treat damaged, dry and flaky scalp. It also strengthens brittle and weak hair. Combine 1 tablespoon of apple cider vinegar and 2 tablespoons of cornmeal. Add it to 1/2 cup of grape seed oil and mix well. Massage the mixture onto the scalp and leave it on for 1 hour. Wash off with water and shampoo as normal. Peppermint contains anti-inflammatory and antiseptic properties which helps to reduce itchiness caused by dandruff. Add 1 cup apple cider vinegar and 5 peppermint leaves into a cup of hot water. Let it steep for 2 hours. Spritz it on scalp thoroughly. Note: Alternatively, you can rinse your hair with the solution after shampooing. Rosemary is loaded with strong anti-fungal properties which helps to treat dandruff effectively. Witch hazel soothes the inflammation and itching caused by dandruff. In a bowl, combine 1 cup of ACV, 1 tablespoon of rosemary oil, and a few drops of witch hazel. Rinse scalp with warm water, then pour mixture over wet hair. Massage scalp for 3 minutes and then comb the hair. Leave the application for 20-30 minutes and rinse with cool water. This herbal combination works effectively in treating dandruff, itchy scalp and oily scalp. In this process, we use calendula flowers, sage, thyme and chamomile flowers. Boil 2 cups apple cider vinegar. Remove from heat and add 1 teaspoon each of calendula flowers, dried sage leaves, dried thyme leaves and dried chamomile leaves into it. Let it steep for 2 hours or overnight. Strain and pour the solution into a bottle. Now, combine 1/8 cup ACV solution with 1 cup water. Leave it on for few minutes and rinse off with shampoo. Note: Alternatively, instead of adding all the herbs, you can add any one herb of your choice. Tea tree oil contains anti-bacterial and antifungal properties. Olive oil helps to nourish and moisturize the scalp. Combine 1 cup distilled water, 1/4 cup of ACV, 5 drops tea tree oil, 1/2 teaspoon of olive oil, and juice of half a lemon. Pour the mixture into a spray bottle, shake well, and spray onto the scalp. Wrap the hair with towel and leave it on for 30-60 minutes. Honey locks the moisture in the skin cells to keep the scalp hydrates. Combining apple cider vinegar with honey makes the solution more effective in curing dandruff. Combine 1/2 cup of warm water, 1/3 cup of apple cider vinegar and 3 tablespoons of raw honey. Repeat the process once in a week to get rid of dandruff. The anti-fungal properties of tea tree oil kill the fungus malassezia which is responsible for dandruff. In a medium-sized bowl, add 1/2 cup each of apple cider vinegar and water. Add 5 drops of tea tree oil into it and mix well. Using a cotton ball, apply the solution onto the scalp. Gently massage for few minutes and leave it on for 30 minutes. Repeat the process once in every alternate day until the dandruff clears. Yogurt contains proteins and vitamin B5 which are essential for hair and scalp health. It also contains antibacterial properties which reduce the irritation caused by dandruff. Combine 1/2 cup yogurt and 1 teaspoon of apple cider vinegar. Apply the mixture on the scalp while it is still wet. Note: Make sure to use only plain yogurt. Sweetened and flavored yogurt can irritate the skin and worsen the condition. Baking soda exfoliates dead skin cells and impurities accumulated on the scalp. It balances the pH level of the scalp which creates inhospitable environment for fungus growth. Make a paste by combining enough amounts of apple cider vinegar and baking soda. Gently massage the mixture on the scalp. After few minutes, rinse off with cool water. Aloe vera contains anti-fungal, antiseptic and anti-inflammatory properties. It soothes and moisturizes the dry scalp. Into a bowl, add 2 tablespoons of apple cider vinegar, 1 tablespoon of honey and 1 cup of aloe vera gel. Repeat the process 2 – 3 times in a month. Ginger contains anti-fungal and anti-inflammatory properties. It restricts the growth of fungus and soothes the itchiness. Into a glass bottle, add 3 parts of apple cider vinegar and 1 part of ginger powder. Close the lid and place it in a cool and dark place for a week. Shake the bottle once in a day to ensure proper infusion. After one week, combine equal amounts of distilled water and ginger-infused water. Apply the mixture onto the scalp. Repeat the process regularly until you get rid of shampoo. Note: You can store the remaining ginger-vinegar infusion in refrigerator. Hydrogen peroxide contains antimicrobial properties which eliminates the fungus causing dandruff. In this process, you have to use 3% hydrogen peroxide. Mix 1 part hydrogen peroxide, 1 part vinegar and 10 parts of water. Repeat the process few times in a month. Coconut oil stimulates hair growth and prevents dandruff. Due to its moisturizing properties, avocado moisturizes the scalp and prevents flaking. Apply the solution all over the scalp and leave it on for 5 – 10 minutes. Now, combine avocado pulp and coconut oil. Apply the mixture on scalp while the hair is still wet. Massage gently with your finger tips and leave it for about 20 – 30 minutes. If you are looking for quick respite from the annoying white flakes and dry scalp then this method is the best one. Apple cider vinegar treats the dandruff, while chamomile soothes the irritated scalp. Boil 3 ½ liters of water and remove from the heat. Add 4 – 5 chamomile tea bags and let it steep for 15 – 20 minutes. Once the tea cools down to lukewarm, add 4 – 5 drops of chamomile oil and 1/2 cup of apple cider vinegar into it. Stir the solution and pour it over the scalp. This combination provides quick relief from the symptoms of dandruff. Lavender oil is known for its soothing properties which provide relief from itchy scalp and helps it recover fast. Into a bowl, add 1/2 cup of apple cider vinegar, 1/4 cup of water and 2 – 4 drops of lavender oil. Mix well and apply it onto the scalp and hair. Cover your head with shower cap and leave it on for 30 minutes to 1 hour. Always use raw, organic, unprocessed apple cider vinegar that contains the Mother element for effective results. Apple cider vinegar fumes can sting the eyes, so use it in a properly ventilated space. Don’t worry about the smell that is left behind by ACV as it wears off once your hair dries. Maintain good hygiene and avoid overuse of styling products. Drink 8 – 10 glasses of water to maintain your scalp hydrated. Refrain from using shampoos that contains harsh chemicals. Reduce stress levels as it is one of the trigger for dandruff. Yoga, meditation or other forms of exercising can help to reduce stress levels. Don’t scratch your scalp as it can worsen the problems and cause secondary infections. Eat a healthy diet rich in zinc, magnesium, omega fatty acids and probiotics. We hope the home remedies for dandruff information provided in this article was helpful for you. If you have any concerns or suggestions, write to us in the comments section below. We will answer to your concerns as soon as possible. We would love to hear your experiences as well. You can try as you have described. Once in a week should be enough. Share your experience with us. Thanks for your information renee walls. I’ve been using 1:1 ratio of rosemary tea (made from my own herbs) and raw apple cider vinegar. I put it in a spray bottle and keep it in the fridge. When it’s hair washing day, I put the bottle in a mug of hot water to warm it up. I spray it all over my scalp and massage it. I leave it on for an hour and then wash my hair as usual. I have dandruff and eczema on my scalp. I’ve noticed that after doing this, when I get out of the shower, I see LARGE dandruff flakes the size of my thumb nail, in my hair. Does the tea or ACV cause this? Is this good or bad? Thank you for the great post! I have the same symptoms and I usually just have the ACV with the mother in a spray bottle and will use it as a conditioner after washing my hair with a natural coconut shampoo. I’ve never had the large flakes but I remember my late natropath doctor said he had the large flakes like you do but it was never a bad sign. It just means that the dandruff (which is mostly dead skin and oil that’s formed a “crust”) is coming off. I’d say your mixture is effective, but if it scares you, I’d try just doing a quick 3min soak after shampoo in the shower/bath and rinsing instead of leaving it on an hour. I do this every 2-3 days and it has an amazing result. I barely feel it after a week and I’ve had so much that when I scratch, it created ridges and grooves it was so thick. Can only organic apple cider vinegar can be used?can we use “apple cider vinegar the all natural choice for food”? you should use only organic apple cider vinegar for effective results.